It is a privilege to be invited into someone’s home to paint a nursery mural for them. I try never to take this for granted. Every project is exciting for its own reasons. 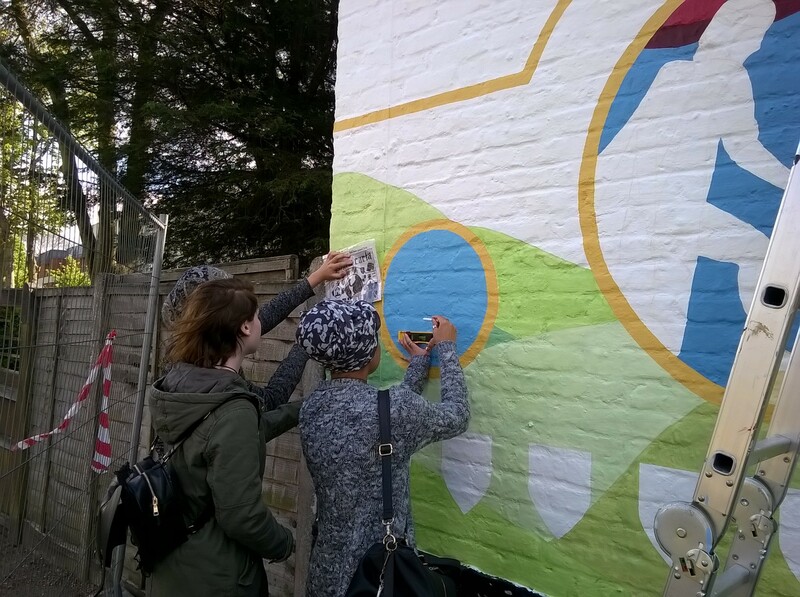 However, painting a mural when someone is expecting their first child is always especially lovely. 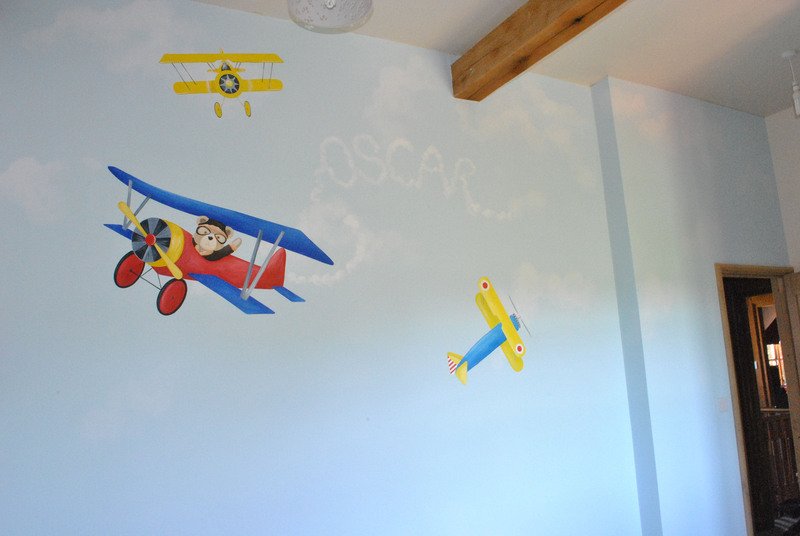 So, when almost 2 years after painting little Oscar’s nursery, I was asked to paint a mural for his new big boy bedroom, as he has a new baby brother on the way, I felt very lucky. I also added to the nursery mural I painted originally. 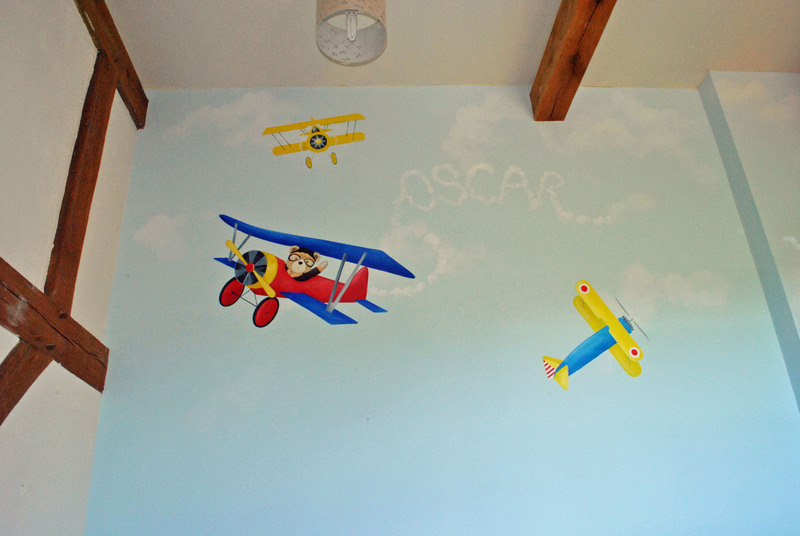 For the original nursery mural, I painted a pale blue cloudy sky, and hot air balloons. As a main feature I painted an old-fashioned teddy bear in the main balloon. I also added bunting, with Oscar’s name written on it. 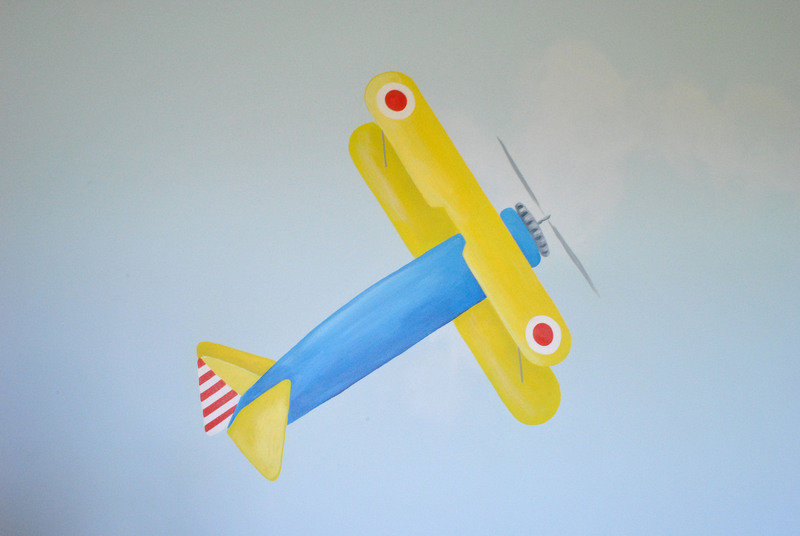 While I used the same sky blue and old-fashioned teddy bear theme for the bedroom mural, this time I painted vintage airplanes. I have used sky writing to feature his name on the wall. 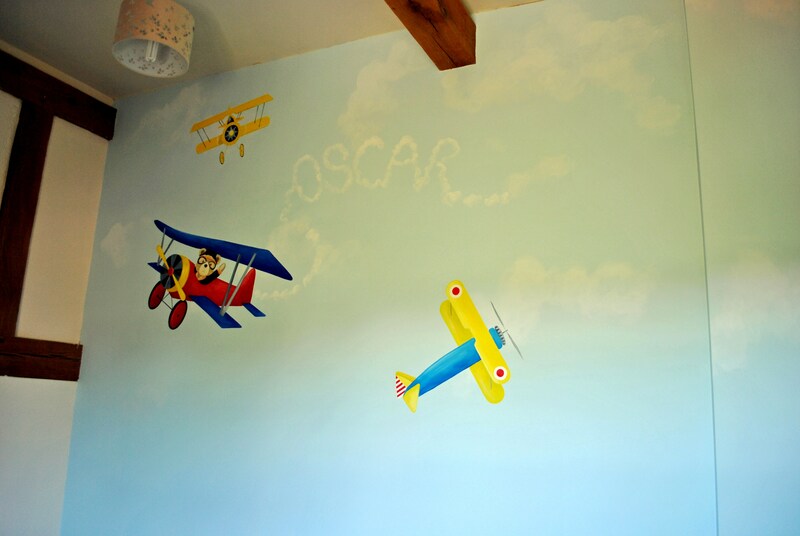 I used a palette of red, blue and yellow for the planes, because these colours are suitable for a boy’s bedroom, but still nice and bright and cheerful. 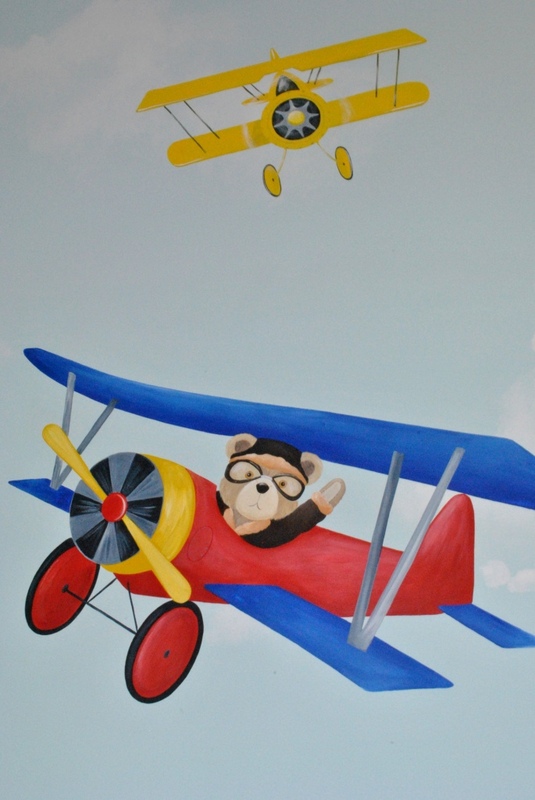 The teddy bear in the plane is giving Oscar a little wave as he flies by! I hope Oscar enjoys his new bedroom, and being a big brother! Err, probably. A 20+ ft scaffold tower was not my favourite thing to be teetering at the top of. 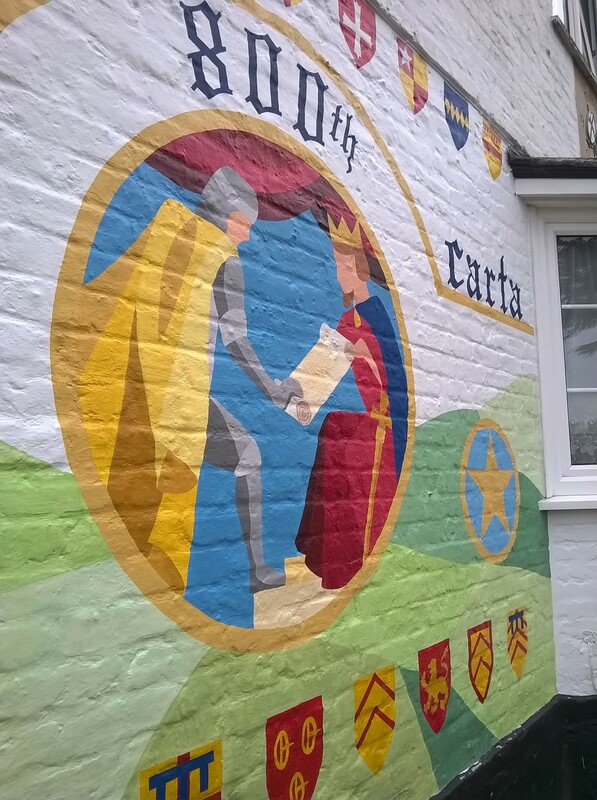 However, I think it was worth it in the end to create this eye-catching exterior mural! 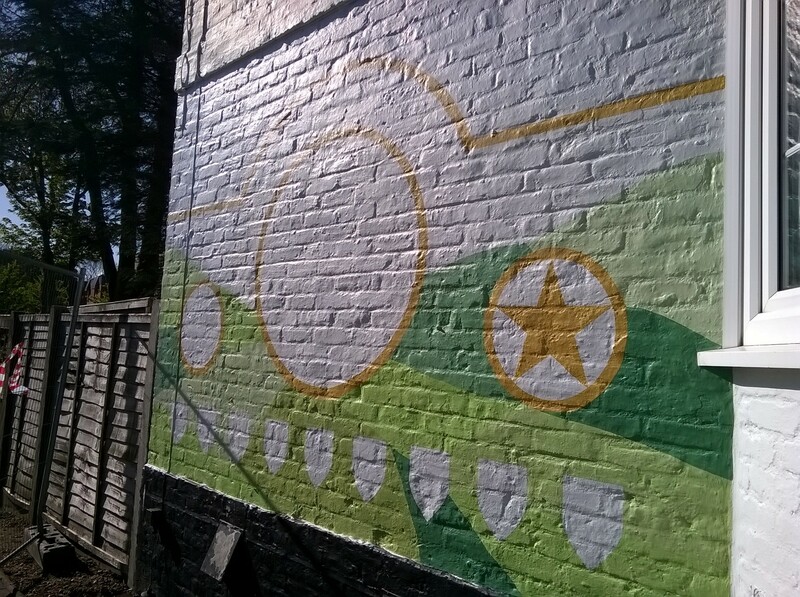 Relocation, relocation… I spent the last week up in Bolsover, working on the side of this fruit & veg shop. It’s been hard work, and physically very tough. There is nothing worse than climbing to the top of a scaffold tower, only to realise I’d left my paint brush back at the bottom etc etc. My mood was cheered however by the very friendly locals! Located next to the local Co-Op, I had many passers by who were so encouraging with their feedback. 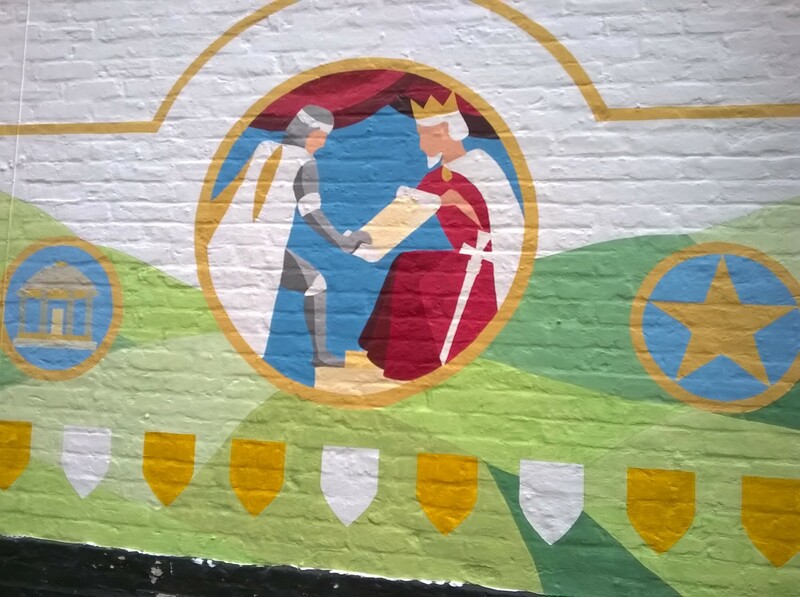 It seems the people of Bolsover love their new mural! The project has taken 5 days to complete, including varnishing. I had to just get over my fear and started at the top and worked down. Last night, I finished with the lettering, and then varnished this morning. “Freezing cold” is how I would have described myself by the end of Friday evening. 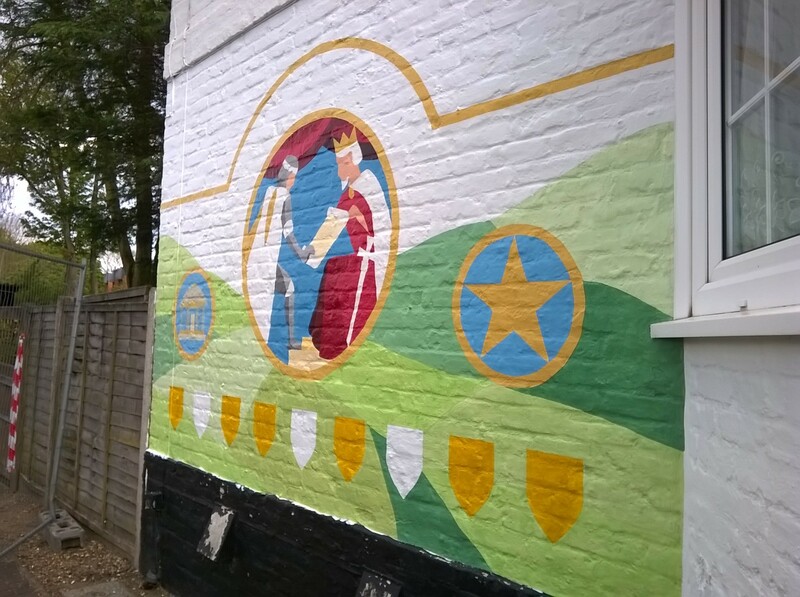 But pretty chuffed to have pushed through and got the first mural completed. 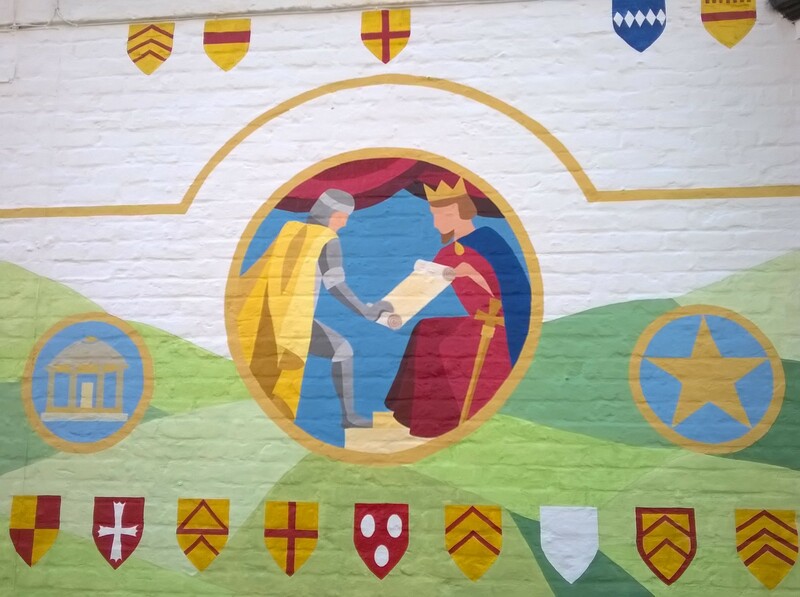 Or almost…for those paying attention, there are 18 shields on the wall, representing not quite all of the 25 Magna Carta barons, and the remaining 7 are due to go elsewhere on the building, which I’m hoping to do next week. 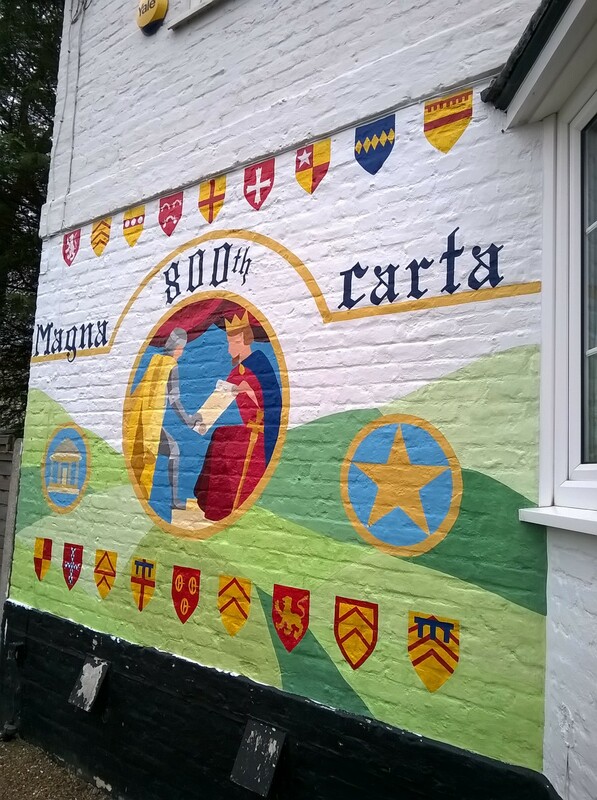 So, I just need a big enough window in the weather to get those remaining shields on the wall and then varnish, and mural number one is all done! Pictures of progress at the end of days 3 and 4 are below. 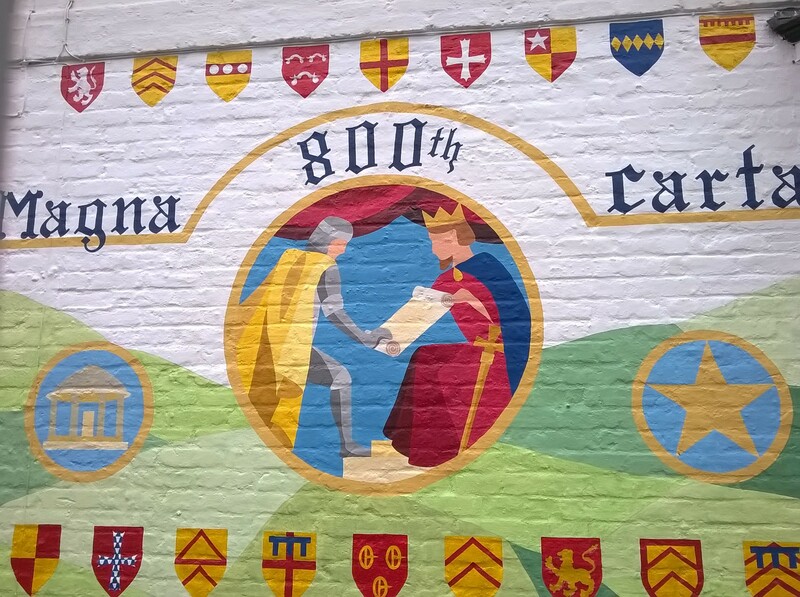 Day 1 and 2 at Bell Weir lock in Runnymede, painting commemorative murals for the 800th anniversary of the Magna Carta. 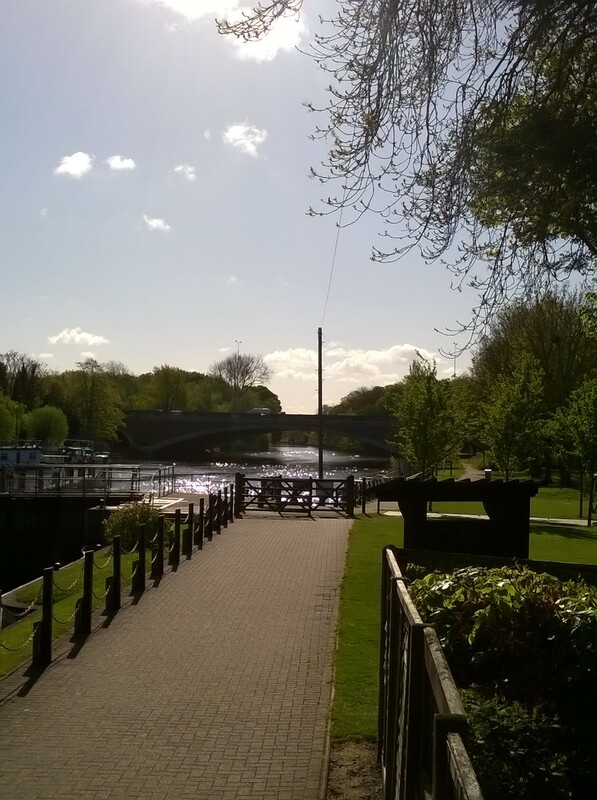 Rain has unfortunately stopped play today, but as you’ll see from one of the photos below, the sun was glistening on the river at the start of the week. It has however been totally freezing, not helped by the fact that the wall is in shadow for most of the day. Back to wearing thermals! 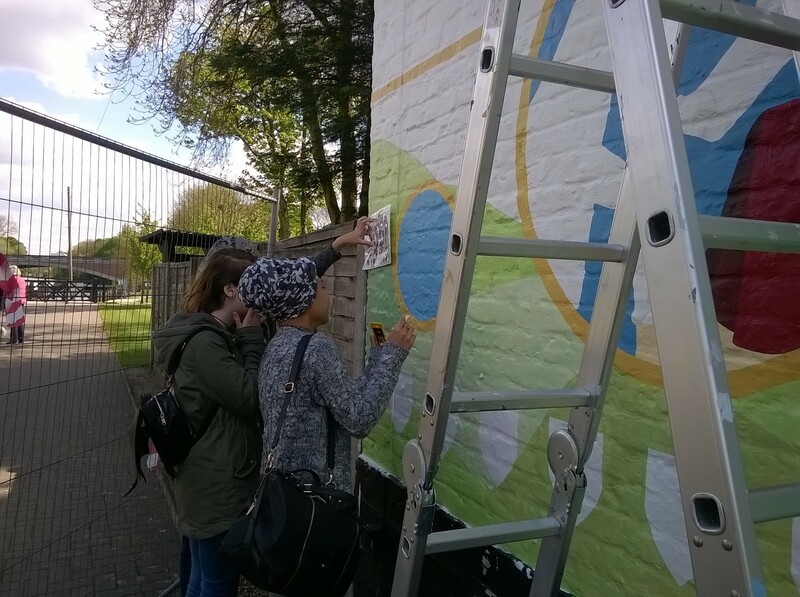 Yesterday I met with the students, from East Berkshire college in Windsor, to speak to them about their designs, get a better idea of the inspiration for their work, and consult with them on any design changes I need to make in order to paint them as murals. I’m very much hoping that the girls will come and help me do some of the painting once the work gets going!